The South is often considered a single region from anyone looking in, but is in fact quite diverse and filled with the myriad cultures and experiences of its residents. 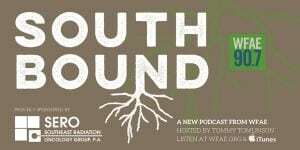 SouthBound, a new podcast presented by WFAE and hosted by journalist Tommy Tomlinson, sets out to explore the experiences of people born and raised in the South, and how living within the region influenced and shaped their lives. After developing throat cancer in his 20’s and losing 40% of his voice box, Tomlinson’s journalism style and career changed to the distinctive style he uses today. Conversations and storytelling reveal that a single region holds a vast array of experiences, views, and angles for residents of all walks of life across the South. Southeast Radiation Oncology is proud to sponsor SouthBound, and we are thrilled to share the news about this exciting podcast.